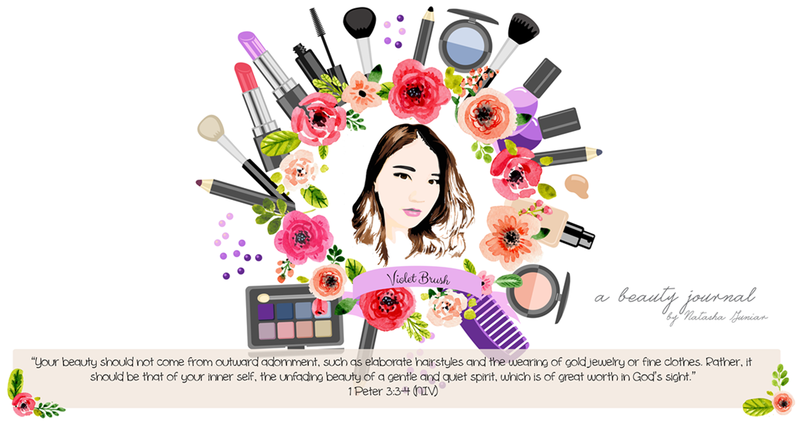 It's been a while since the last time I had a collaboration with Clozette Indonesia. 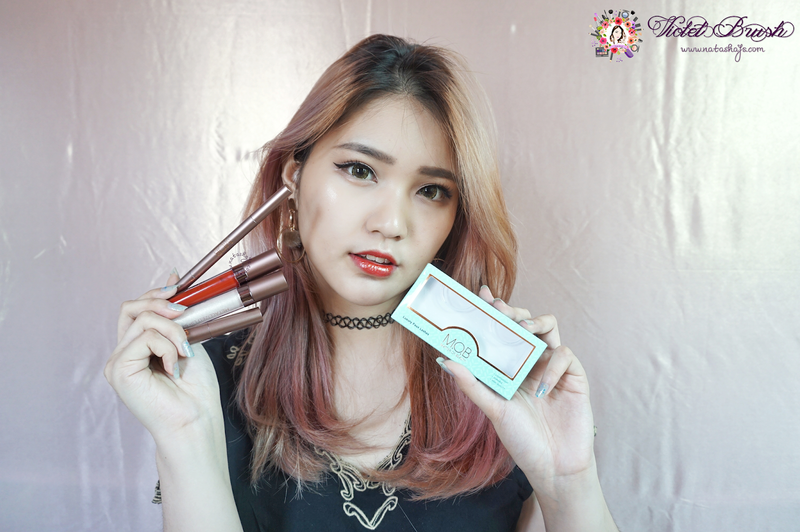 This time I'm collaborating with Clozette Indonesia to bring you a quick review of MOB Cosmetic. 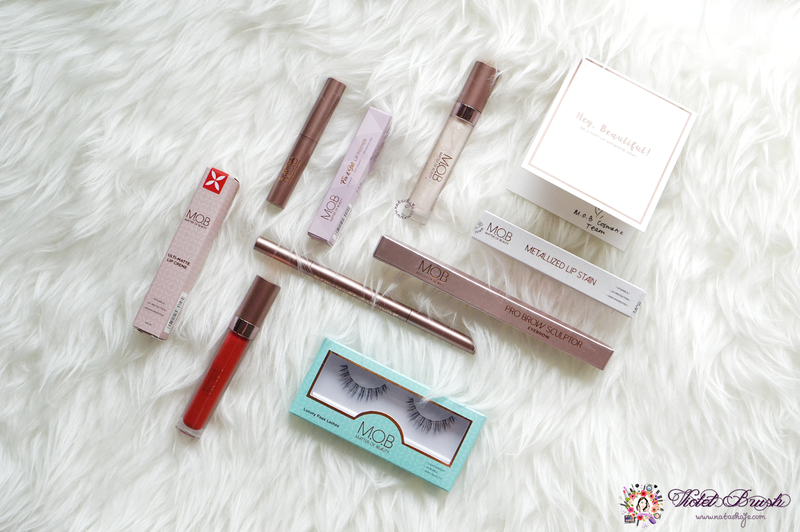 The name MOB itself is the abbreviation of Matter of Beauty and the brand is still fairly new in the industry (launched in 2016). Good news is, they're vegan and cruelty-free! 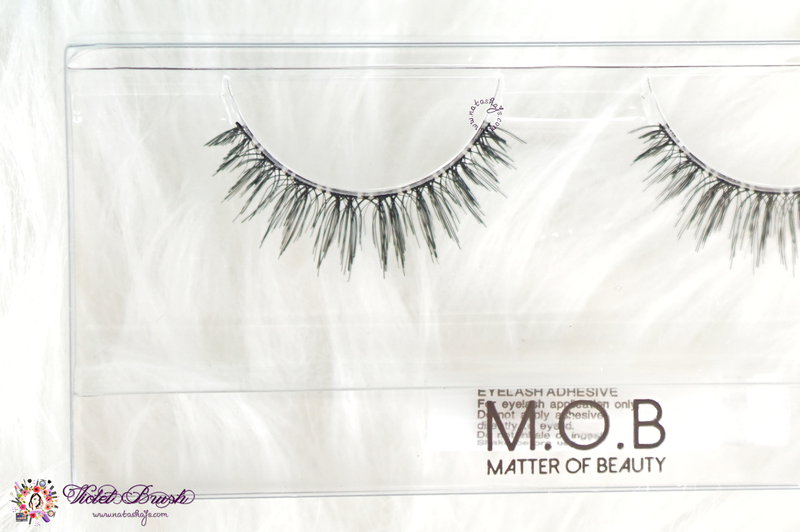 Check out more about MOB Cosmetic on www.mobcosmetic.com ! 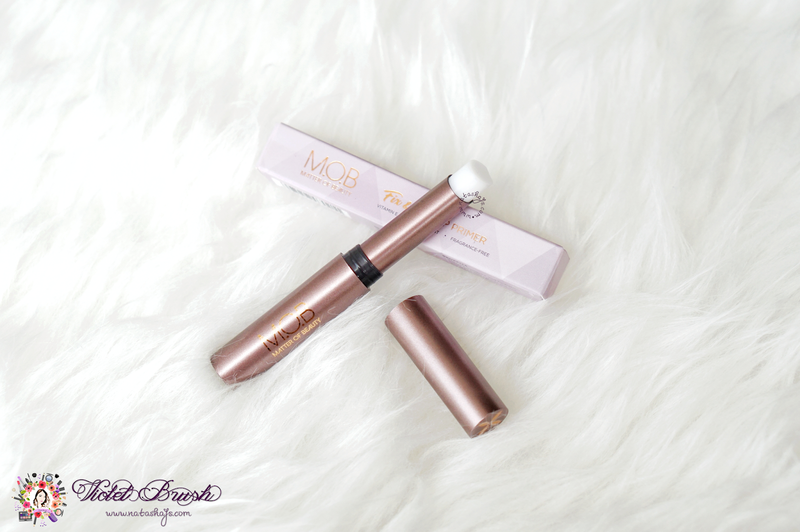 I love LOVE the rose-gold color of the MOB Cosmetic's packaging. It makes the product looks luxurious. Well, I rose-gold is one of my favorite color, though. I also like how the cap of the pencil 'click' so no more loose caps. 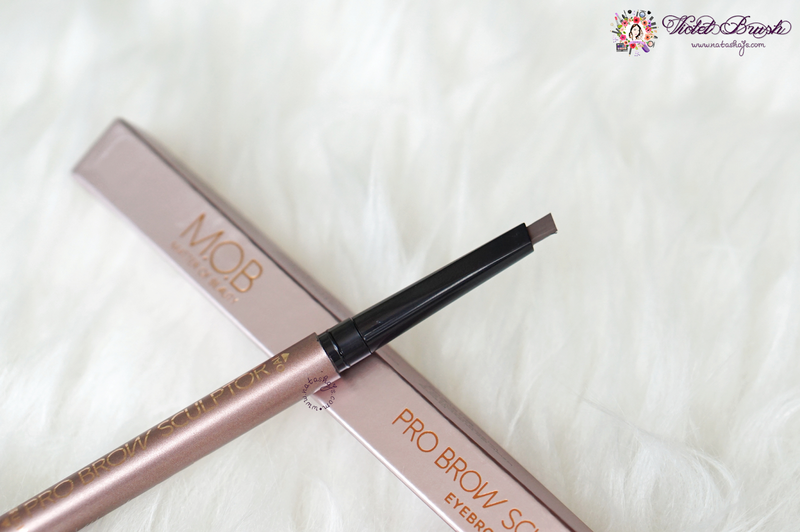 The triangular pencil of MOB Cosmetic's Pro Brow Sculptor is a little bit thicker than the one I usually use. However, it's still fairly easy to use and it glides on smoothly, way more smoothly than I thought. But due to its thicker pencil, it might be a little bit hard to achieve defined Insta brows, which is not my preference anyway so I'm satisfied enough with this. 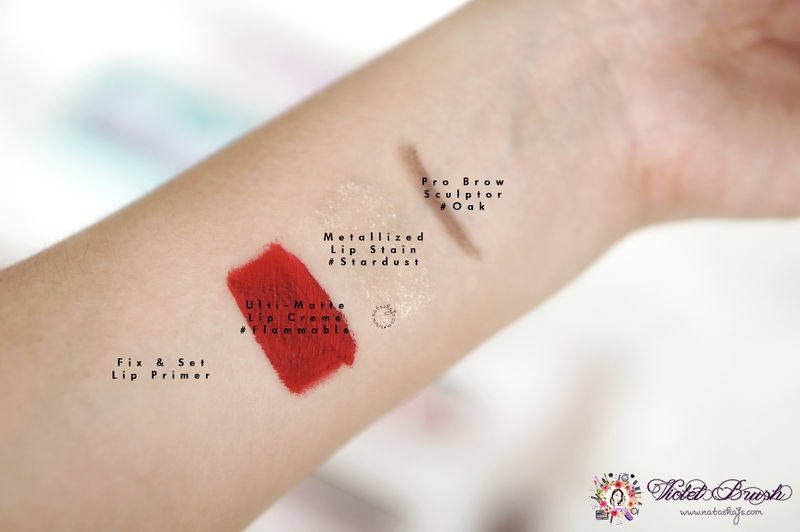 Upon first swatch on my hand, I thought the Oak shade of MOB Cosmetic's Pro Brow Sculptor would be to reddish on my skin tone but after I used it on my brows, surprisingly it matched my skin tone very well! Made with 100% cruelty-free and highest grade of synthetic hair, making them ultra-soft, very natural looking, lightweight and durable. 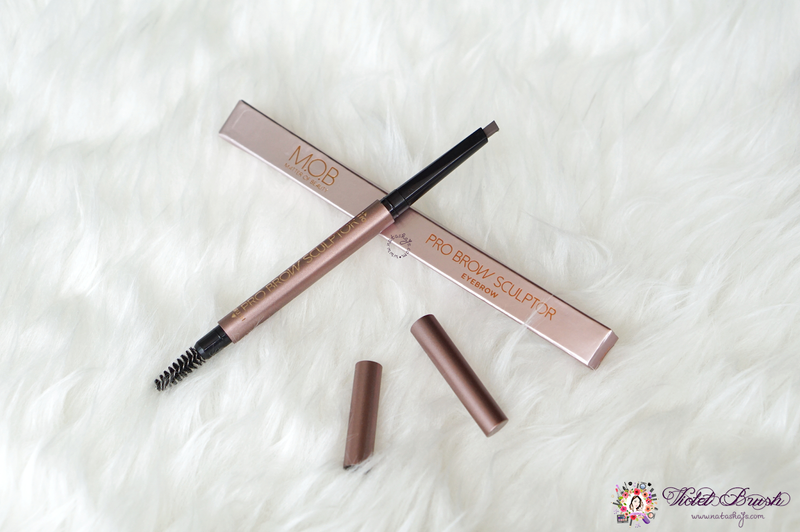 My first impression on MOB Cosmetic's Luxury Faux Lashes in Mademoiselle was that they were so natural but still long enough to make your eyes pop. The band might look pretty long for my small eyes but turns out it fits my eyes perfectly. 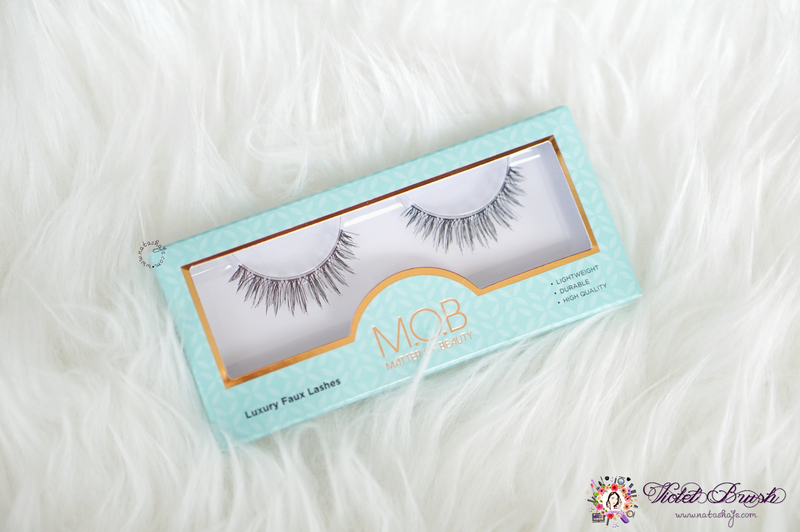 It is said on their website that MOB Cosmetic's Luxury Faux Lashes are made with highest grade of synthetic hair which is ultra-soft, natural looking, and lightweight. Well, I can vouch for that. 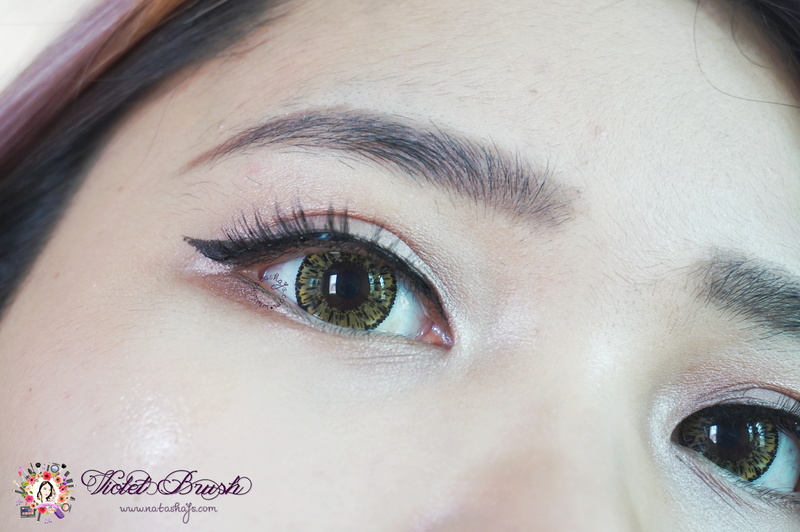 They are indeed very soft, looks natural on my eyes but still makes my lashes look beautifully long, and has feather-like weight. I can't really say anything on their durability yet, though. First thing first is to take care of your lips! Healthy lips are as important as healthy skin. Our Fix & Set Lip primer provides moisture and hydration to your lips all day long. Infused with Vitamin E and Anti-oxidant, our superstar product will fulfill its duty to cover your lip lines, smoothes and refines the lips and to avoid feathering when you wear any kind of lipsticks or lip liquids. The one thing you need to know that our Fix & Set primer also enhances and protects your lip colors all day long! 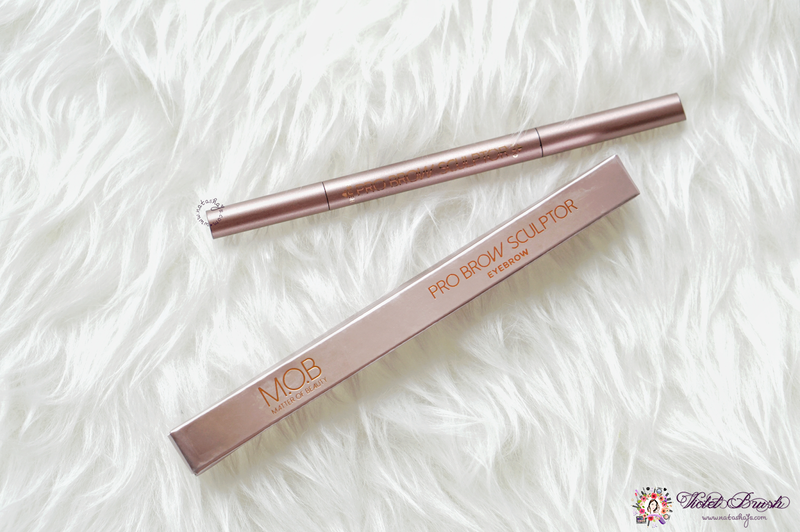 Just like MOB Cosmetic's Pro Brow Sculptor, MOB Cosmetic's Fix & Set Lip Primer comes in a rose-gold packaging. It's color-less and works almost like a lip balm. It also smells like vanilla, another favorite of mine. Calling all the real women to pull off their look with Flammable. This red is sizzling and like the name itself, it is so hot it can cause a fire! Wear this and believe that you are truly a diva. Haters, move aside, just be intimidated. 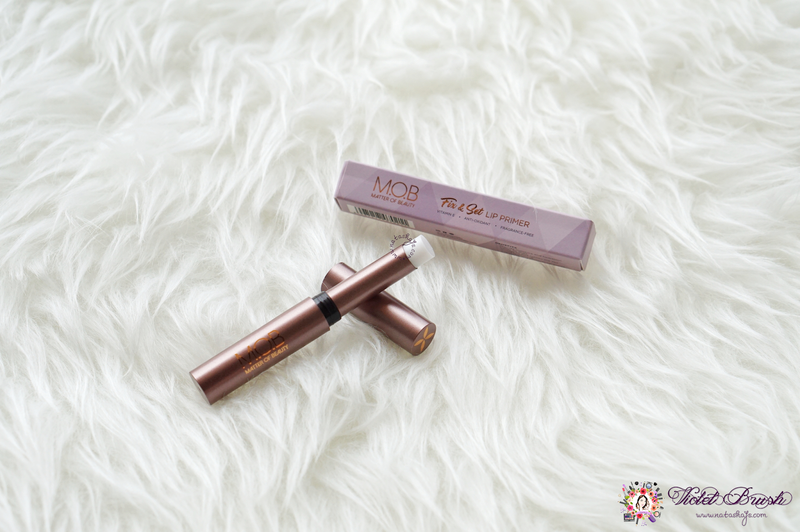 I would say that the packaging of MOB Cosmetic's Ulti-Matte Lip Creme is a typical lip cream packaging with slanted applicator. The applicator is slim enough for easy application, but not slim enough to reach the corners of the lips for more precise application. On the other hand, I can't pinpoint what kind of scent it is but I don't really like its scent. Make your lip seen like a million dollar with Stardust. Use it with any lip color you have and Stardust is guaranteed to glitter them out. The transparent lip topper with white based and gold glitter will cover your lip perfectly to mesmerize them all! 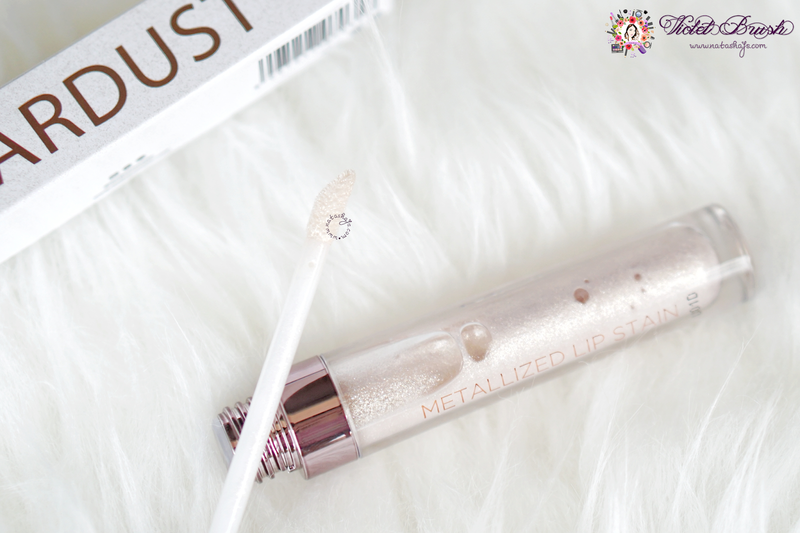 MOB Cosmetic's Metallized Lip Stain in Stardust works like a lip gloss. 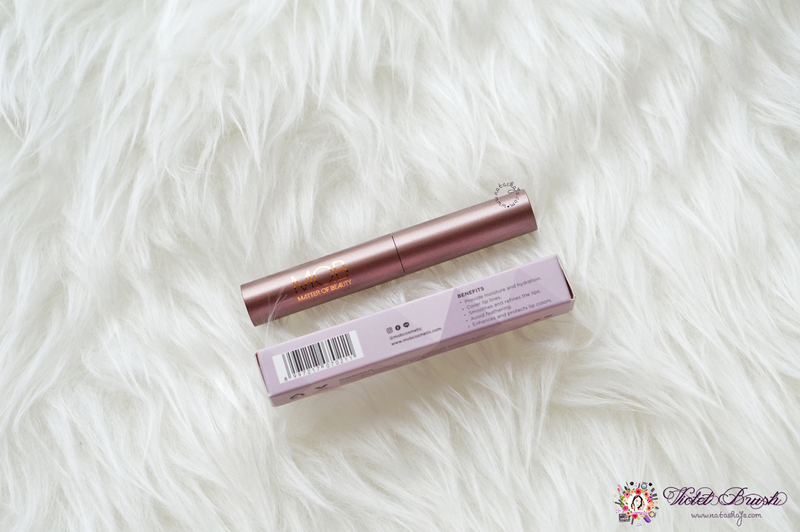 It comes in a similar packaging and applicator with MOB Cosmetic's Ulti-Matte Lip Creme. It smells like a really sweet vanilla, Natasha approves! 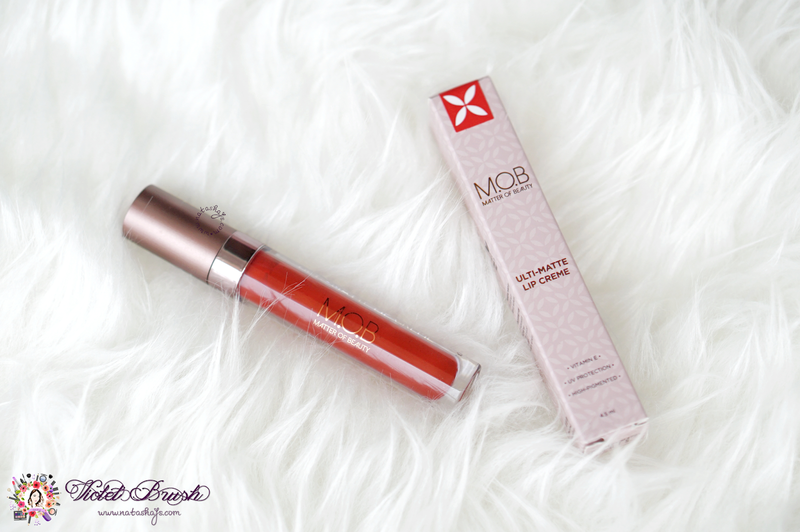 MOB Cosmetic's Ulti-Matte Lip Creme in Flammable is a bright red matte lip cream with bluish undertone. This might not be my everyday color but I would pull it off for special occasions. 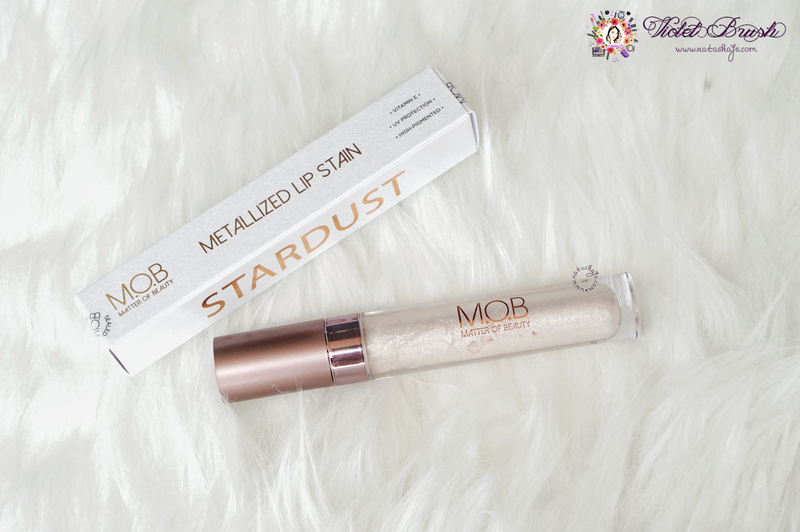 MOB Cosmetic's Metallized Lip Stain in Stardust is a white lip gloss with golden glitters. The subtle glitters give a nice and healthy shine to your lips. On the lips, MOB Cosmetic's Ulti-Matte Lip Creme in Flammable looks fiery, just like its shade name. It's highly pigmented and dries fast as it claimed. If you're planning to use this for gradation lips, better move fast. The texture itself is pretty thick and feels quite dry on my lips. Seeing that it dries really fast, I was hoping for a transfer-proof formula but it still transfers, unfortunately. 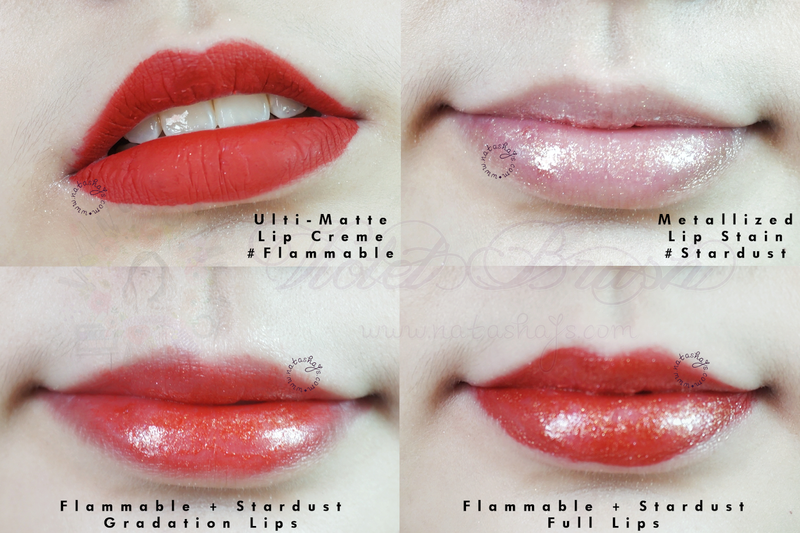 I personally think that MOB Cosmetic's Ulti-Matte Lip Creme and MOB Cosmetic's Metallized Lip Stain is a match-made. 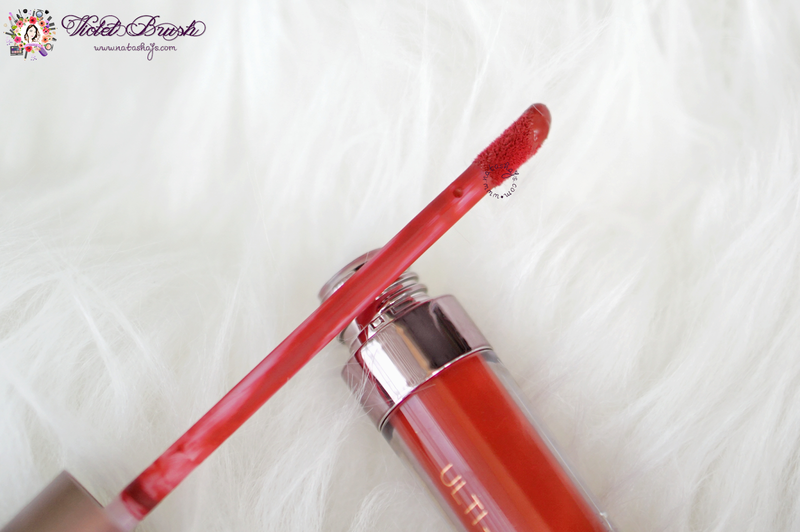 While the Ulti-Matte Lip Creme feels dry on my lips, Metallized Lip Stain provides the moisture my lips needed. It's very moisturizing without being too sticky. Although I wouldn't use it alone, I love how it works over matte lips. I also love to use it as a highlighter, it's blinding enough but not that extra. On the other side, MOB Cosmetic's Fix & Set Lip Primer works really well as a primer to provide a good canvas for my lipsticks. It makes my chapped lips soft so that lipsticks or lip creams could glide on smoothly. It also provides the necessary moisture for my lips. However, I don't think it holds the lip color in place for so long. The lip color still fades after eating a bowl of greasy bakmi ayam (chicken noodles). Yes! I would love to try other designs too. Definitely a yes! I love how it makes lip cream glides smoothly on my lips. I'm not really sure, it's pretty dry on my lips. Yes, I would love to try other shades too.